THE Linux Foundation (LF) isn’t what it seems from the outside. The name, the logo and the marketing make it look very “professional”, but what profession are these people? Well, the management is nontechnical and many come from marketing and branding (like Microsoft) rather than engineering and administration. It’s a cultural misfit. “It’s a cultural misfit.”Having asked RMS (Richard Stallman) about the matter, and having exchanged a couple dozen E-mails per day (at most), we have been attempting to understand the difference between the Linux Foundation and the Free Software Foundation (FSF). Putting aside the FSFE gaffe last month (over copyright in the EU), we’re generally supportive of the FSF and its unofficial branches around the world (there is one in India too) because they focus on freedom rather than some brand or trademark. We also spoke to Alexandre Oliva (Red Hat and GNU) in an effort to verify claims that had been sent to us. This took weeks to fact-check and some of the claims remain to be proven because LibrePlanet, the FSF’s ‘equivalent’ of LF events, uses different terminology. One reader told us about “CoC for LibrePlanet drama,” but as it turns out we are hearing different stories. “At LibrePlanet,” says this reader, “I was surprised to see an old friend who really wanted to talk to me about all this CoC stuff. In fact, it was someone who tried to recruit me into being on the CoC staff for the next Hope. At first, I was interested, but I never went. Those who are mentioned likely know who’s who, but we’re not mentioning names here (we keep it impersonal). We don’t want to be accused of emboldening personal attacks. This angle of the story has generally required me to do a lot of editing after asking around without divulging some identities/names. WE FINALLY GOT some feedback regarding the baffling patent agreement which seemingly affects every user of GNU/Linux. We got this feedback from Stallman and (indirectly) Moglen, two of the Free software world’s most prominent individuals, especially when it comes to the GPL (GNU Public Licence/License). As discussed earlier in IRC (freenode), I have been pursuing answers from Red Hat regarding an urgent matter. I previously interviewed their CEO regarding patents and last week I spoke to a fairly senior person from Red Hat (unnamed for his own protection), for the third time this month. I wrote about 10 articles on this subject and it led to others writing about it as well, including some prominent bloggers. “We need to understand what Red Hat agreed on with Microsoft on as Microsoft can use this behind closed doors against other companies, for pressure/leverage.”To put it concisely, Red Hat signed a deal with Microsoft which not only involved technical work but also what they call patent “standstill”. Who is this “standstill” for? Apparently Red Hat and its customers. I strongly doubt, especially in light of Alice v. CLS Bank, that a “standstill” should be needed. Red Hat does not threaten to sue Microsoft, whereas Microsoft did in the past threaten Red Hat (even publicly). This leaves those outside Red Hat in an awkward position and ever since this deal I have taken note of at least two companies being coerced by Microsoft using patents (over “Android” or “Linux” [sic]) or sued by one of its patent trolls, e.g. Intellectual Ventures. This isn’t really a “standstill”. It’s more like the notorious “peace of mind” that Novell was after back in 2006. Red Hat has also admitted to me that it is still pursuing some software patents in the USPTO — a fact that does not surprising me, especially given the soaring market cap of RHT and the growing budget. This serves to contradict what people like Rob Tiller say to the courts; it shows double standards and no principled lead by example. “The analysis and the voice of the FSF may be needed at this stage.”I have asked the FSF’s Joshua if it had looked into the patent agreement between Red Hat and Microsoft. Their lawyers in this case, Mr. Piana and Mr. Tiller (probably amongst others whom we don’t know about yet), would probably claim and even insist that it’s GPL-compatible, but the wording in the FAQ make it look exclusionary and there’s no transparency, so one cannot verify these claims. We need to understand what Red Hat agreed on with Microsoft on as Microsoft can use this behind closed doors against other companies, for pressure/leverage. I am genuinely worried and fellow journalists who focus on GNU/Linux (Sean Michael Kerner for instance) tell me that they are too. The analysis and the voice of the FSF may be needed at this stage. I have politely urged Red Hat for a number of weeks to become more transparent, whereupon some in the company said they had escalated these requests, but evidently nothing is being done, hence I feel the need to turn to the FSF. I would gladly provide additional information that I have upon request. “We know too little about the patent aspects,” I explained. 4. Does the new partnership address patents? Red Hat and Microsoft have agreed to a limited patent arrangement in connection with the commercial partnership for the benefit of mutual customers. The heart of the arrangement is a patent standstill that provides that neither company will pursue a patent lawsuit or claim against the other or its customers, while we are partnering. Neither company acknowledged the validity or enforceability of the other’s intellectual property; it is not a patent license or a covenant not to sue and no payment was made or will be made for intellectual property. The partnership is between commercial companies related to their common customer offerings, spurred by customer demand. Both parties carefully designed for FOSS licensing compliance in building the arrangement and each party’s relationship to the FOSS community stands on its own. Well, as GPLv3 co-authors, their take on this sure counts. We therefore got an answer without taking a look at the contract itself (they had made access to it highly privileged information). IN recent weeks we have found several ‘news’ articles that gave us cause for concern. Some were shared with Richard Stallman, a regular reader of Techrights, for his views to be expressed and portions of the correspondence can be found here (cautiously redacted to reduce potential animosity/tensions). There was also an effort to delete GNU from history — an effort that has gone rather aggressive. Stallman was in the process of speaking to editors who jad allowed this to happen (dumb lawyers called GNU and Stallman’s text “Open source Manifesto” in the article “Open source Manifesto turns 30″). Stallman asked me to show him the original publication site and tell him how to write to them. It wasn’t too clear whether to write to the editor/site or the author/law firm. The former can issue some fixes/corrections, we tend to think, superseding what was contributed by lawyers. The article comes from a formal publication which often publishes patent lawyers’ pro-software patents columns (we have seen over 100 of them over the years). The target audience is lawyers. The latest is no exception to the rule. It is an article by Leech Tishman Fuscaldo & Lampl LLC and the Web site is London-based, with Andrew Teague as the Associate Publisher, Mark Lamb as the Publishing Director, and Chris Riley handling subscriptions. 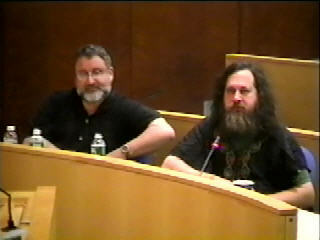 When it was first published Stallman was eager to contact “Either one, or both! [editor and writer] But the sooner the better.” No correction has yet been published. It’s nowhere to be found. Rachel Roumeliotis is advertising OSCON 2015 (OS stands for “Open Source”), but she should know about GNU and its age. These people conveniently start the clock when O’Reilly and his henchmen got involved. They want all the credit and they want people not to speak about freedom. Eben Moglen already ranted about this, right on stage in an OSCON event nearly a decade ago. 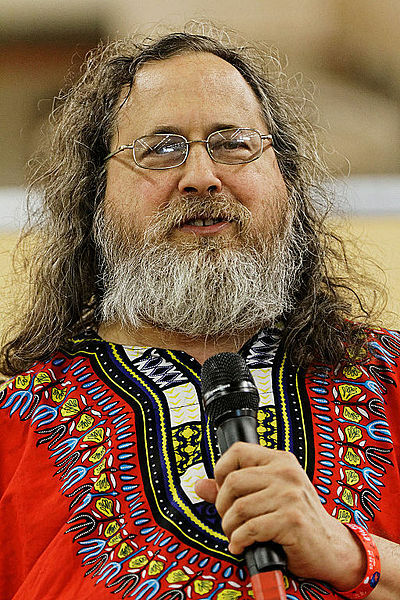 “This shows how “open source” misses the point,” Stallman wrote to us. “If the frameworks, languages and tools they use are free software, that is good for their freedom. But if what they develop with those is nonfree software, it doesn’t respect our freedom. 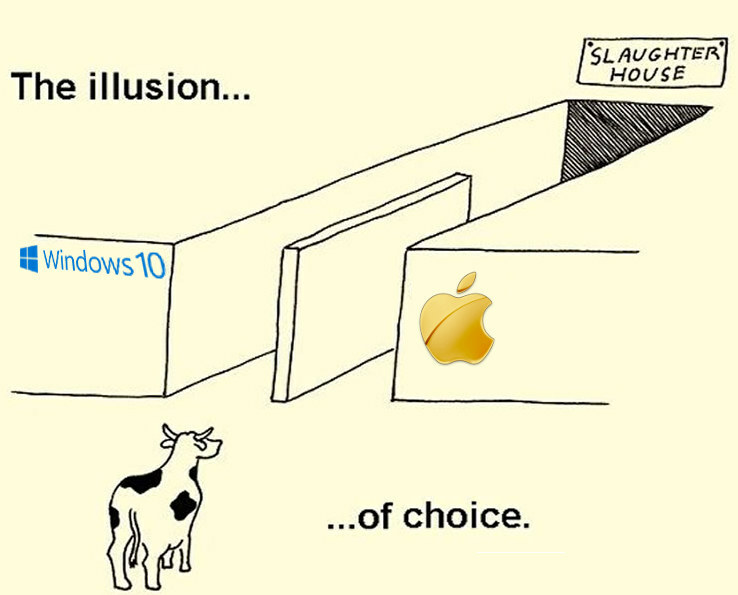 We have noticed that Microsoft is now googlebombing with “Windows open source”, promoting the ludicrous notion that it’s now “open” (or gratis), or that it will be so one day. It started about a month ago, maybe two; dozens of articles have served this PR strategy. we wrote some rebuttals and will write another one this weekend. There is a gross distortion of what actually happened and what is happening. “We have noticed many articles throughout this past year or so — including some from Linux Foundation staff — that basically start history in 1991 as if GNU/Linux came out of a vacuum or from Torvalds’ bedroom.”Actually, unless they are using something like the BSD licence, they usually must. Then there are issues like SaaS, which are addressed by the AGPLv3, among other licences. But either way, Free software remains Free software, there is no justification for renaming it “Open Source” and calling the GNU Manifesto “Open source Manifesto”. It’s insulting to those who started the whole thing and wish to receive fair coverage or attribution, at the very least. Stallman said he “wrote to them”, but more than a month later the article remains uncorrected, not updated, etc. It is of course worthless asking for a correction when you know in advance none would be made. It later turned out to be part of a broader series of articles, some of which did cover GNU. I personally read several hundreds of items from the author and he’s more into ‘practical’ benefits, so I don’t think it would be worth arguing over. Some people just aren’t fond of freedom in the context of computing. We have noticed many articles throughout this past year or so — including some from Linux Foundation staff — that basically start history in 1991 as if GNU/Linux came out of a vacuum or from Torvalds’ bedroom. Quite frankly, we think it’s an insult to history. We deem it negligent at best. Of course it leads people to deducing that the success of the system in its entirety is owing to the great “Linux values”, not GNU philosophy. To what extent do the ideas of free software extend to hardware? Is it a moral obligation to make our hardware designs free, just as it is to make our software free? Does maintaining our freedom require rejecting hardware made from nonfree designs? Free software is a matter of freedom, not price; broadly speaking, it means that users are free to use the software and to copy and redistribute the software, with or without changes. More precisely, the definition is formulated in terms of the four essential freedoms. The freedom to run the program as you wish, for any purpose. The freedom to study the program’s source code, and change it so it does your computing as you wish. The freedom to make exact copies and give them or sell them to others. The freedom to make copies of your modified versions and give them or sell them to others. Applying the same concept directly to hardware, free hardware means hardware that you are free to use and to copy and redistribute with or without changes. But, since there are no copiers for hardware, aside from keys, DNA, and plastic objects’ exterior shapes, is the concept of free hardware even possible? Well, most hardware is made by fabrication from some sort of design. The design comes before the hardware. Thus, the concept we really need is that of a free hardware design. That’s simple: it means a design that permits users to use the design (i.e., fabricate hardware from it) and to copy and redistribute it, with or without changes. The design must provide the same four freedoms that define free software. Then “free hardware” means hardware with an available free design. People first encountering the idea of free software often think it means you can get a copy gratis. Many free programs are available for zero price, since it costs you nothing to download your own copy, but that’s not what “free” means here. (In fact, some spyware programs such as Flash Player and Angry Birds are gratis although they are not free.) Saying “libre” along with “free” helps clarify the point. For hardware, this confusion tends to go in the other direction; hardware costs money to produce, so commercially made hardware won’t be gratis (unless it is a loss-leader or a tie-in), but that does not prevent its design from being free/libre. Things you make in your own 3D printer can be quite cheap, but not exactly gratis since you will have to pay for the raw materials. In ethical terms, the freedom issue trumps the price issue totally, since a device that denies freedom to its users is worth less than nothing. The terms “open hardware” and “open source hardware” are used by some with the same concrete meaning as “free hardware,” but those terms downplay freedom as an issue. They were derived from the term “open source software,” which refers more or less to free software but without talking about freedom or presenting the issue as a matter of right or wrong. To underline the importance of freedom, we make a point of referring to freedom whenever it is pertinent; since “open” fails to do that, let’s not substitute it for “free”. Is Nonfree Hardware an Injustice? Ethically, software must be free; a nonfree program is an injustice. Should we take the same view for hardware designs? We certainly should, in the fields that 3D printing (or, more generally, any sort of personal fabrication) can handle. Printer patterns to make a useful, practical object (i.e., functional rather than decorative) must be free because they are works made for practical use. Users deserve control over these works, just as they deserve control over the software they use. Distributing a nonfree functional object design is as wrong as distributing a nonfree program. Be careful to choose 3D printers that work with exclusively free software; the Free Software Foundation endorses such printers. Some 3D printers are made from free hardware designs, but Makerbot’s hardware designs are nonfree. Must we reject nonfree digital hardware? Is a nonfree digital hardware(*) design an injustice? Must we, for our freedom’s sake, reject all digital hardware made from nonfree designs, as we must reject nonfree software? Due to the conceptual parallel between hardware designs and software source code, many hardware hackers are quick to condemn nonfree hardware designs just like nonfree software. I disagree because the circumstances for hardware and software are different. Present-day chip and board fabrication technology resembles the printing press: it lends itself to mass production in a factory. It is more like copying books in 1950 than like copying software today. Freedom to copy and change software is an ethical imperative because those activities are feasible for those who use software: the equipment that enables you to use the software (a computer) is also sufficient to copy and change it. Today’s mobile computers are too weak to be good for this, but anyone can find a computer that’s powerful enough. Moreover, a computer suffices to download and run a version changed by someone else who knows how, even if you are not a programmer. Indeed, nonprogrammers download software and run it every day. This is why free software makes a real difference to nonprogrammers. How much of this applies to hardware? Not everyone who can use digital hardware knows how to change a circuit design, or a chip design, but anyone who has a PC has the equipment needed to do so. Thus far, hardware is parallel to software, but next comes the big difference. You can’t build and run a circuit design or a chip design in your computer. Constructing a big circuit is a lot of painstaking work, and that’s once you have the circuit board. Fabricating a chip is not feasible for individuals today; only mass production can make them cheap enough. With today’s hardware technology, users can’t download and run John H Hacker’s modified version of a digital hardware design, as they could run John S Hacker’s modified version of a program. Thus, the four freedoms don’t give users today collective control over a hardware design as they give users collective control over a program. That’s where the reasoning showing that all software must be free fails to apply to today’s hardware technology. In 1983 there was no free operating system, but it was clear that if we had one, we could immediately use it and get software freedom. All that was missing was the code for one. In 2014, if we had a free design for a CPU chip suitable for a PC, mass-produced chips made from that design would not give us the same freedom in the hardware domain. If we’re going to buy a product mass produced in a factory, this dependence on the factory causes most of the same problems as a nonfree design. For free designs to give us hardware freedom, we need future fabrication technology. We can envision a future in which our personal fabricators can make chips, and our robots can assemble and solder them together with transformers, switches, keys, displays, fans and so on. In that future we will all make our own computers (and fabricators and robots), and we will all be able to take advantage of modified designs made by those who know hardware. The arguments for rejecting nonfree software will then apply to nonfree hardware designs too. That future is years away, at least. In the meantime, there is no need to reject hardware with nonfree designs on principle. *As used here, “digital hardware” includes hardware with some analog circuits and components in addition to digital ones. Although we need not reject digital hardware made from nonfree designs in today’s circumstances, we need to develop free designs and should use them when feasible. They provide advantages today, and in the future they may be the only way to use free software. Free hardware designs offer practical advantages. Multiple companies can fabricate one, which reduces dependence on a single vendor. Groups can arrange to fabricate them in quantity. Having circuit diagrams or HDL code makes it possible to study the design to look for errors or malicious functionalities (it is known that the NSA has procured malicious weaknesses in some computing hardware). Furthermore, free designs can serve as building blocks to design computers and other complex devices, whose specs will be published and which will have fewer parts that could be used against us. Free hardware designs may become usable for some parts of our computers and networks, and for embedded systems, before we are able to make entire computers this way. Free hardware designs may become essential even before we can fabricate the hardware personally, if they become the only way to avoid nonfree software. As common commercial hardware is increasingly designed to subjugate users, it becomes increasingly incompatible with free software, because of secret specifications and requirements for code to be signed by someone other than you. Cell phone modem chips and even some graphics accelerators already require firmware to be signed by the manufacturer. Any program in your computer, that someone else is allowed to change but you’re not, is an instrument of unjust power over you; hardware that imposes that requirement is malicious hardware. In the case of cell phone modem chips, all the models now available are malicious. Some day, free-design digital hardware may be the only platform that permits running a free system at all. Let us aim to have the necessary free digital designs before then, and hope that we have the means to fabricate them cheaply enough for all users. Copyright 2015 Richard Stallman. Released under Creative Commons Attribution No Derivatives 3.0 license. Richard Stallman: What Does It Mean for Your Computer to Be Loyal? We say that running free software on your computer means that its operation is under your control. Implicitly this presupposes that your computer will do what your programs tell it to do, and no more. In other words, that your computer will be loyal to you. In 1990 we took that for granted; nowadays, many computers are designed to be disloyal to their users. It has become necessary to spell out what it means for your computer to be a loyal platform that obeys your decisions, which you express by telling it to run certain programs. Our tentative definition consists of these principles. The computer will run, without prejudice, whatever software you install in it, and let that software do whatever its code says to do. A feature to check for signatures on the programs that run is compatible with this principle provided the signature checking is fully under the user’s control. When that is so, the feature helps implement the user’s decision about which programs to run, rather than thwarting the user’s decisions. By contrast, signature checking that is not fully under the user’s control violates this principle. The computer will communicate, without prejudice, through whatever protocol your installed software implements, with whatever users and whatever other networked computers you direct it to communicate with. This means that computer does not impose one particular service rather than another, or one protocol rather than another. It does not require the user to get anyone else’s permission to communicate via a certain protocol. When the computer communicates using any given protocol, it will support doing so, without prejudice, via whatever code you choose (assuming the code implements the intended protocol), and it will do nothing to help any other part of the Internet to distinguish which code you are using or what changes you may have made in it, or to discriminate based on your choice. This entails that the computer rejects remote attestation, that is, that it does not permit other computers to determine over the network whether your computer is running one particular software load. Remote attestation gives web sites the power to compel you to connect to them only through an application with DRM that you can’t break, denying you effective control over the software you use to communicate with them. Netflix is a notorious example of this. We can comprehend remote attestation as a general scheme to allow any web site to impose tivoization or “lockdown” on the local software you connect to it with. Simple tivoization of a program bars modified versions from functioning properly; that makes the program nonfree. Remote attestation by web sites bars modified versions from working with those sites that use it, which makes the program effectively nonfree when using those sites. If a computer allows web sites to bar you from using a modified program with them, it is loyal to them, not to you. When the computer receives data using whatever protocol, it will not limit what the program can do with the data received through that communication. Any hardware-level DRM violates this principle. For instance, the hardware must not deliver video streams encrypted such that only the monitor can decrypt them. The computer always permits you to analyze the operation of a program that is running. The computer comes with full documentation of all the interfaces intended for software to use to control the computer. The principles above apply to all the computer’s software interfaces and all communication the computer does. The computer must not have any disloyal programmable facility or do any disloyal communication. What’s even more troubling right now is that Vista 8 is self-updating (for the latest back doors to be installed) and Ryan tells us that “Microsoft is about to get rid of support for Windows 8.1 without the update pack, and it seems the broken Windows Update problem is still pretty common.” To quote: “Check your Windows Update log, if you’ve got a “Failed” entry next to KB2919355 then your PC will also become orphaned after May 8.” So much for ‘security’. In order to install Linux from a bootable USB stick I need to be able to get to the Boot Selection menu, but on Acer systems with UEFI firmware, this is a bit tricky. The Boot Menu key (F12) is disabled by default, so I first have to boot to the BIOS Setup Utility, by pressing F2 during the power on or reboot cycle. Then in the Main setup screen there is an option to enable “F12 Boot Menu”. That’s one trick down, but there’s another one which might be required. Depending on what version of Linux you want to install, and perhaps how you feel about Secure Boot, you might want/need to disable that. In the BIOS Setup Utility, on the Boot menu there is an option to disable Secure Boot – but I can’t get to it: moving the cursor down just skips over it! I can change boot mode from UEFI to ‘Legacy BIOS’, but that isn’t what I want to do. I learned (the hard way) with my previous Acer Aspire One, that I have to go to the Security menu and set a “Supervisor Password” before it will let me disable Secure Boot mode. I’m sure this makes sense to someone, but whoever that is, it isn’t me. In this case I am going to start by installing Linux with Secure Boot still enabled, so I don’t really have to do this, but I went ahead and set a supervisor password anyway, because I will eventually want to turn off Secure Boot anyway. An ordinary computer user would give up at this stage.